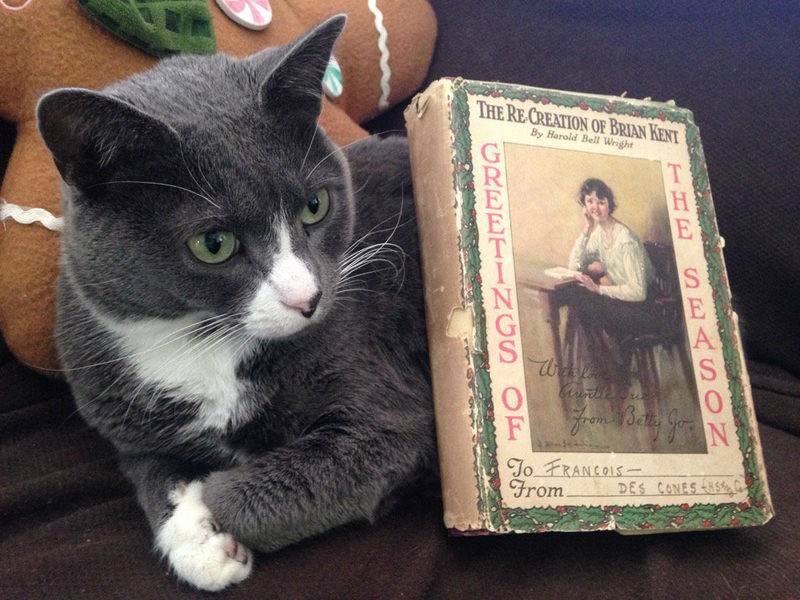 Today's Christmas post is presented by Mr. Angelino, who is excellent at sleeping, but is always intrigued by a fine old book or piece of ephemera.1 What he has beside him is a copy of the 1919 novel The Re-creation of Brian Kent, by Harold Bell Wright.2 This is the second novel by Wright to be featured on Papergreat; the first one, way back in 2011, was Helen of the Old House, which had some mystery photos tucked away inside. There are two inscriptions on this "Greetings of the Season" jacket. The first one is actually part of the illustration. It mentions Auntie Sue and Betty Jo, who are characters in the novel.3 Below that, we see that the book was gifted to Francois, from "Des Cones (HS and Co.)." I'm a little stumped about whether Des Cones is a person, place or thing. While the gift dust jacket is, understandably, a bit worn, it's done a nice job of protecting the original dust jacket underneath. 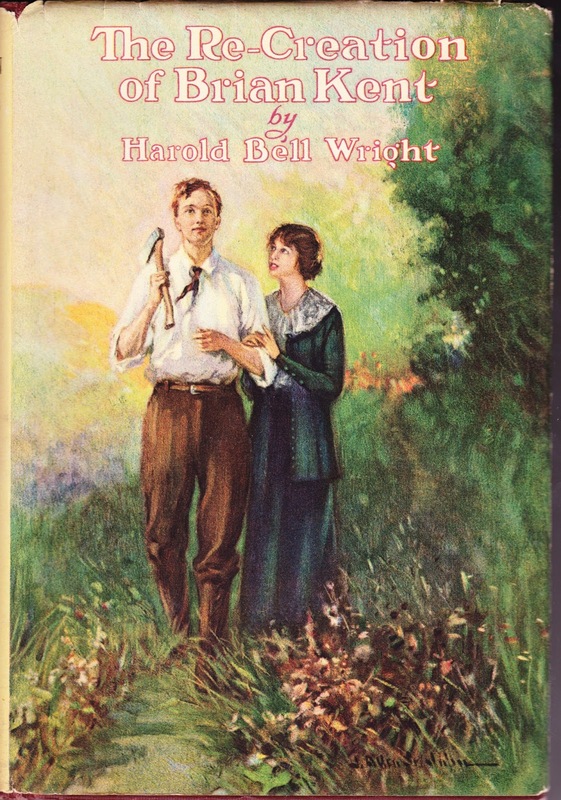 This novel was published by The Book Supply Company of Chicago and had a price of $1.50, which would be about $21 today. 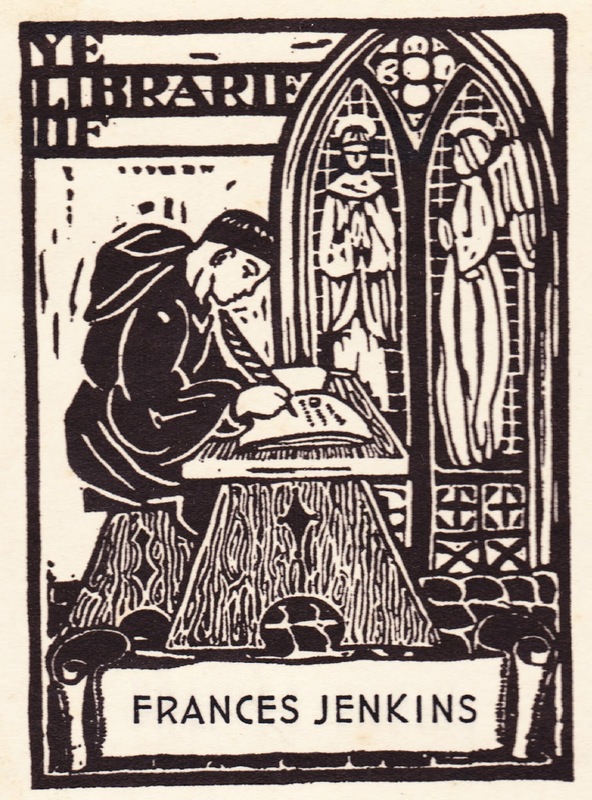 One final cool thing is this "Ye Librarie Of" bookplate for Frances Jenkins, which is affixed to the inside front cover. Frances, I would guess, is "Francois." 1. Mr. Angelino, our youngest cat, is also known as Mr. A and Mystery. Mr. Angelino is the name he had at the shelter, so we didn't change that. 2. Despite being nearly a century old, The Re-creation of Brian Kent is well-reviewed on Goodreads. 3. 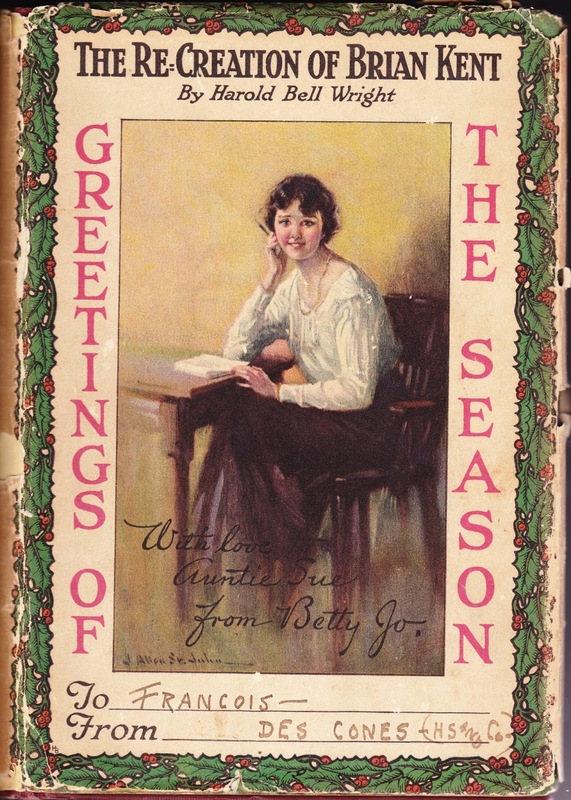 This same illustration serves as the book's frontispiece. 4. Frank Frazetta is featured in the February 2016 post "'Creepy' would like to you drop that expensive smoking habit."